These breathtaking performances continue today. Brilio.net - With "Bhinneka Tunggal Ika" (Unity in Diversity) as the national motto, Indonesia is a melting pot of over 300 ethnic groups, and each of them has its own distinct culture and forms of art. One of the prominent forms of art is the performed art, the traditional dances from various regions in Indonesia. There are many traditional dances in Indonesia, and some of them are world-famous. They’re pretty amazing to watch so if you get the chance, try to check these out. Pendet is one of the famous Tari Bali (Balinese Dances) and it belongs to the Wali category, along with Rejang, Baris, Sanghyang Dedari, and Barong which are sacred dances and created to be performed in the center part of a temple (called jeroan pura). 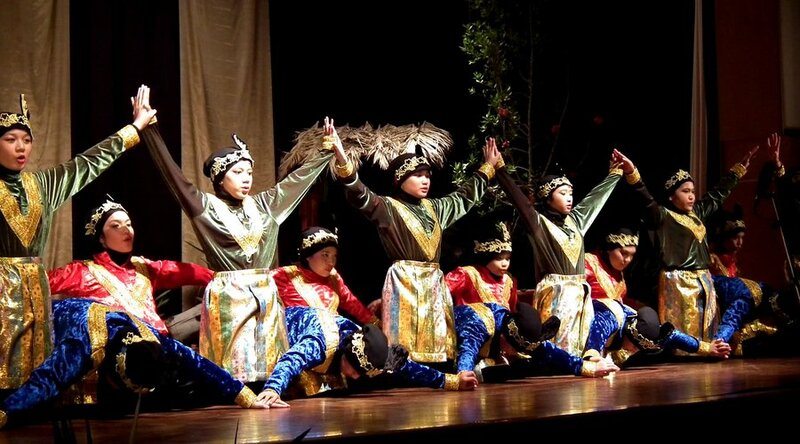 Pendet is usually performed by several female adult dancers with offerings (sesajen) in their hands. It is typically a welcome ceremony. Saman originated from Gayo ethnic group in Aceh and characterized by harmonious, fast-paced rhythmic movements shown by the dancers. This dance is performed without any accompanying music. Instead, the dancers sing songs while performing. 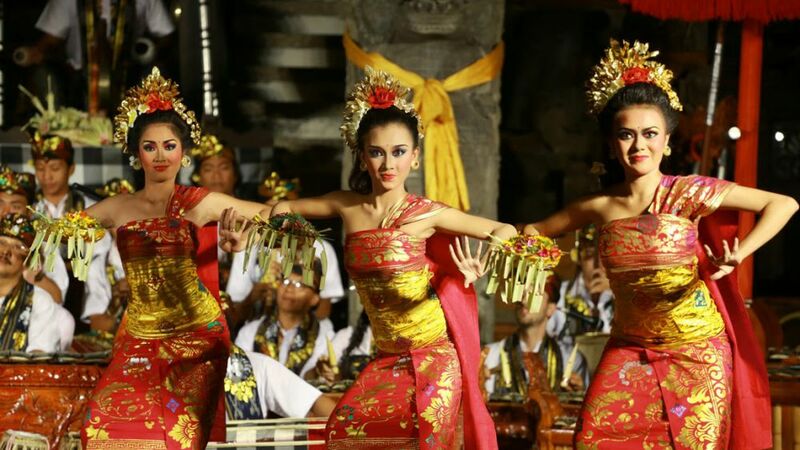 In November 2011, “the dance of a thousand hands” was recognized as a Masterpiece of Oral and Intangible Heritage of Humanity by Unesco and the Asean Tourism Association (ASEANTA) named it as the best Asean cultural preservation effort at the 25th ASEANTA Awards for Excellence 2012. 3. 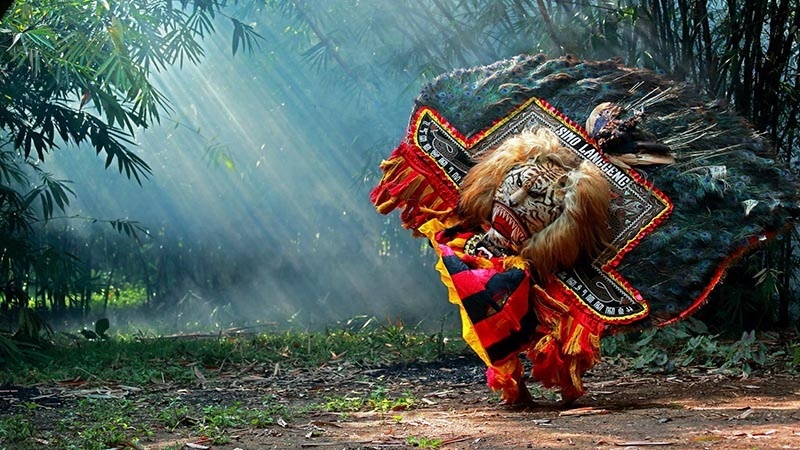 Reog Dance, Ponorogo, East Java. Reog part of Ponorogo's identity. It used to be staged at the night of the full moon, Reog is a dance that's heavily loaded with mystical overtones and superstition. It is all about the story of a battle between the King of Ponorogo against the lion-like mythical creature called Singa Barong. 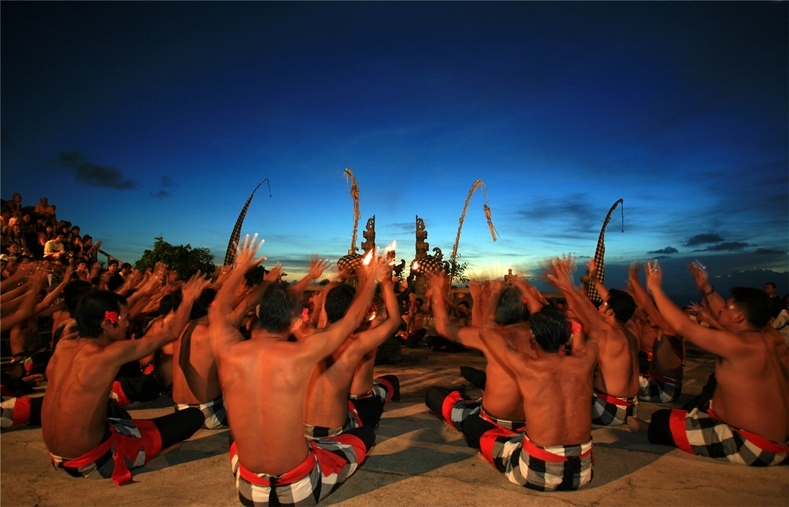 Kecak is part of Balih-balihan dances, one of Tari Bali group. It is performed at night by a hundred or more men who sit around a fire with a leading priest in the middle. The dancers wear sacred Balinese traditional sarongs in black and white, called poleng. They perform without any accompanying music, crying “cak... cak... cak...” in distinct rhythm with their hands raised. The performance depicts one scene in the Ramayana story, where an army of monkeys aids Prince Rama in the battle against the evil Rahwana. Besides the sitting performers, there are also dancers who play Rama, Shinta (Rama’s wife), Rahwana, Monkey King Hanuman, and Sugriwa. One of the most beautiful places to see the Kecak dance is at the Uluwatu Temple. 5. Merak Dance, West Java. Merak (peacock) is one of the prominent dances originated from the land of Pasundan (West Java), displaying graceful movements of male peacocks to attract females. Merak dance, which was created by Raden Tjetjep Somantri during the 1950s, is performed by female dancers in intricate peacock costumes. The dance often becomes a welcoming performance during Sundanese wedding ceremonies.